Hello Fellow German Shepherd Lovers! This is a picture of my darling angel, Griffin. He is 7 months old and the light of my life. The scenery is of beautiful Hart Lake in Ladysmith, BC. Now that Griffin is getting older I can take him on more challenging hikes, he loves it! He always sticks to my side like glue, I never have to worry about him taking off. He is loyal, intellegent and extremely well mannered. He is the epitome of a German Shepherd in every respect. I consider myself extremely blessed to have this magnificent creature as my very best friend. Hey, Victoria, I really appreciate you taking the time to share your handsome Griffin with us all. 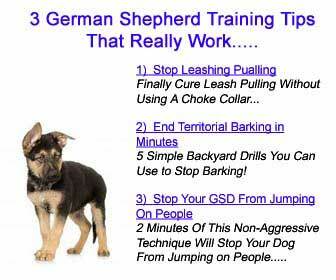 Thank you so much for sharing your great German Shepherd puppy story. What a wonderful story - it's great to hear how happy, playful and what a great athlete he is. Hiking is such a wonderful way to exercise and socialize a dog or puppy - great job! I hope you’re still doing so well with him. He is really a handsome little devil! And that is a wonderful picture too that you have sent in - great job. Did you take it? Your photo is picture perfect!!! 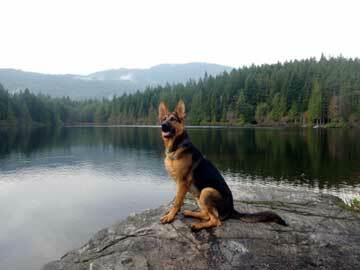 Handsome GSD Griffin. Should be in a calendar..
Griffin is a great dog and I am proud to call him my grandson!